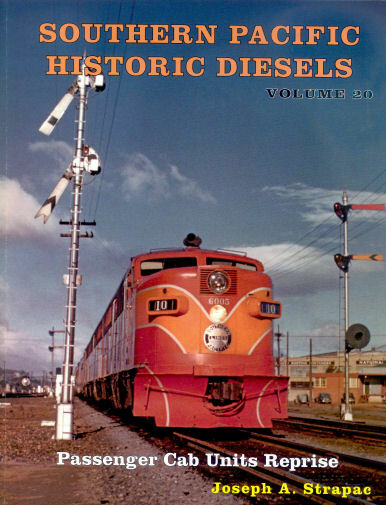 The Southern Pacific and its subsidiaries, the Texas & New Orleans and the St. Louis Southwestern (Cotton Belt) purchased carbody-style diesel passenger locomotives between 1947 and 1955. These were all rated at 2000 to 2400 horsepower; they rolled on six-wheel trucks, each of which carried two traction motors geared to the outer axles. Twenty-eight of them were built by EMD of General Motors, while sixty-six more came from ALCO in Schenectady, New York. Southern Pacific also received 108 class DF-4 F7 locomotives (54 A and 54 B #6186-6239 and #8086-8139) between June and October with model #OK-4740 steam generators, inter-unit water pumping and water tanks, while every F7A in this class had MU steam boiler controls (at the fireman's seat in the cab). Also covered are the EMD E-7s, the E-8, and the EMD E-9s. The T&NO and the SSW PA-1s, and passenger F-7, F-7B, FP-7s and former SP FP-7 and F-7B on Amtrak. In addition there are 16 full pages of color. 310 black & white photos, and 32 full color photos. A full roster is also included. Soft cover.